The February progress report is in and I'm pleased to tell you that Inga has passed the first semester of CCI Advanced Training. Ok, we're not talking Dean's List here, but Eric tells me she is showing improvement. She's a smart girl and I know she's capable of so much more. Just a wee bit stubborn, it would seem. Inga's now moving into the second semester of AT. More is expected of her now as the commands bump up a level in complexity. 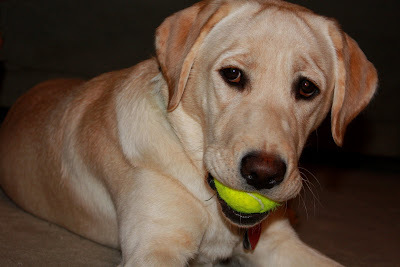 She's learning the retrieve process and working with different types and weights of objects in distracting situations. She's also been out on a couple of field trips. As her puppy raiser, I was glad to see the box checked for "walks nicely on leash" which is one of the top things we're to work on when the pup is with us. A service dog simply cannot pull on leash; not a good thing. If Inga continues to progress, she will have another three to six months of advanced training. As always, let's keep fingers and paws crossed for success for this bright, but independent girl.